We provide digital hearing aid accessories for all brands of hearing aids we sell. These accessories include television links, Bluetooth and wireless accessories. These useful add-ons link to your hearing aids to help you hear more in challenging situations. Retail batteries typically cost $1.00-$1.50 apiece, and we think that's ridiculous. We buy at a bulk rate, and pass the savings on to you. Even if your hearing aids didn't come from Physicians Hearing Center, your batteries should. You can buy by the pack or join the battery club for additional savings. Our custom molded swimming plugs are the very best ear plugs for swimming because of their superior fit, durability, lifespan, and ability to seal water out of the ear canals. Each pair of custom molded swimming ear plugs is custom made to fit your unique ears. 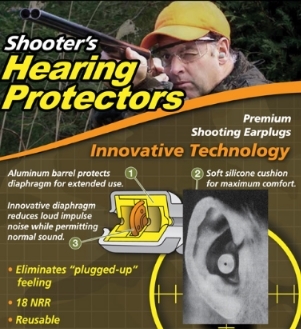 We provide custom and standard fit shooter's ear plugs. These plugs allow normal conversation and game hearing while protecting against blast noise. Think before you shoot. Preserve your hearing.